Could the answer to the Yucca Mountain debacle lurk under a N.M. desert? IN THE CHIHUAHUA DESERT, N.M. -- Bobby St. John is leading a tour of catacombs carved into a salt formation by the Department of Energy when his helmet lamp shines on the last thing you'd expect in one of the Earth's driest places. "There it is!" St. John declares as he examines a tiny water pocket in a dusty salt nugget. In the lamp light jiggles a pinhole-size bubble -- a bright spec in a dark maze of hallways and rooms dug to entomb "old, cold and useless" radioactive waste from the manufacture of atomic bombs. 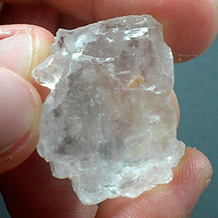 A 250-million-year-old piece of rock salt containing a pocket of ancient seawater. The material underlying the New Mexico desert is being tested for storage of heat-emitting radioactive defense waste. Photos by Hannah Northey. Welcome to DOE's Waste Isolation Pilot Plant, or WIPP, a gift left when seas receded 250 million years ago. Scientists predict that sea salt left here will eventually seal waste forever under the desert about 26 miles east of Carlsbad in southeast New Mexico. That salt is also the reason why WIPP is being studied for possible storage of heat-producing radioactive waste from the Defense Department. WIPP's ability to safely store hot waste will soon be tested. New Mexico Gov. Susana Martinez (R) requested the test, which is being backed by prominent politicians, including Rep. Steve Pearce (R-N.M.), whose district is WIPP's home. 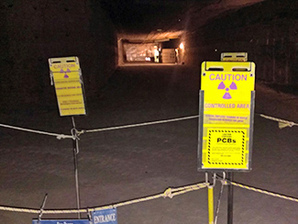 Pearce is portraying the region as a possible successor to the Yucca Mountain, Nev., nuclear waste repository project that was derailed by the Obama administration. Some sources said that would entail the construction of a new repository, perhaps in the same general area as WIPP. "It looks like [the administration is] ready to pull the plug on Yucca, and I think they should go in and start the studies on WIPP to see if it's convertible," Pearce said. "Generally, the opinion around town is that [WIPP is] probably the most geologically stable area that we're going to find. There's no water out there." But even WIPP's biggest boosters acknowledge that Congress would have to act before new waste comes here. And some contend there are rare, lingering safety and environmental concerns that deserve a second look. John Bredehoeft, a former hydrogeologist with the U.S. Geological Survey who worked at WIPP in the 1970s, has warned for years that it is possible for water to pool in WIPP's mines after they're closed off. In a rare case, that could generate gases and increase pressure, and even a pathway for radioactive mud to reach the surface by oil or gas drills, he said. But Bredehoeft acknowledged that the federal government considered such a scenario, which other scientists discounted. "People say, 'Well, lots can happen in a thousand years, this species may not be around. To hell with it, let's do it,'" Bredehoeft said. Don Hancock, a member of the watchdog group Southwest Research and Information Center, called the tests unnecessary in light of decades of research that already found salt isn't an ideal material for a repository. "This is another example of DOE behaving badly," he said, adding that DOE is simply trying to extend the WIPP facility's life by adding on activities. "It's a political program that they're trying to wrap in a scientific veneer." 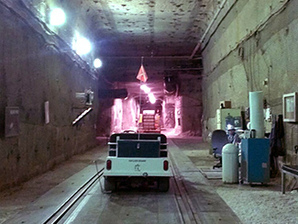 A golf cart greets visitors at the entrance of DOE's Waste Isolation Pilot Plant, a federal facility 2,150 feet below the New Mexico desert where DOE is burying radioactive defense-related transuranic waste. But Hancock also concedes there's widespread support for WIPP in southeast New Mexico. Former Carlsbad Mayor Bob Forrest said he is certain federal law will change and that WIPP will one day replace Yucca Mountain as the U.S. nuclear waste repository. "I don't see them going anywhere else. I don't see the public support," he said. "Without that, they're shooting blanks." Having coffee in downtown Carlsbad at the Blue House Bakery & Cafe, Pat Mack, a former U.S. EPA chemist, said she is "all for" WIPP and so are most of her neighbors. "I've been a strong supporter since the very beginning. We need to get rid of the aboveground storage of nuclear waste," she said. "The best place to put it is in a salt formation." Glen Pfeifer, Mack's friend, said he hunts for quail, dove and deer close to the WIPP site. He also plays off concerns about radioactivity by joking that he's stalked glow-in-the-dark, 600-pound quail at the DOE tract. "You can hunt them at night," Pfeifer said. It's a long elevator ride into the WIPP facility that's farther underground than the Empire State Building is tall. When the elevator cage lurches to a stop, the blue light of overhead lamps reveals a mine shaft and a golf cart driven by tour guide St. John. There's also a sign: "Welcome to the WIPP Underground. You have just entered an environment committed to SAFETY." St. John's cart is bumping along the dimly lit path. He passes chambers where large drums of low-level transuranic defense waste -- a mixture of contaminated clothing, rags and other debris from the nation's weapons complexes -- will eventually be packaged and placed. The hallways go on and on. Stretched out, they are almost 15 miles long. They are lined with nets to catch falling salt rock. Portable toilets and equipment stacks are tucked into dark corners. It looks spartan, but about 800 people work here. And there are underground offices here with Internet access, landline phones, lunchrooms with microwaves and refrigerators, and machine shops. What the future holds for this underground maze is unclear. In 1998, after over 20 years of study and receiving congressional approval, U.S. EPA concluded WIPP could safely hold low-level defense transuranic waste, and DOE started sending the first shipments to the mine by 18-wheelers in March of 1999. It's allowed under the WIPP Land Withdrawal Act to bury only 175,600 cubic meters of certain kinds of waste. Workers could finish that job by 2035, St. John said. The department would then seal off four shafts leading to the underground WIPP complex, and the salt would cave in and then be sealed with 13 layers of concrete and soil. Warning signs in seven languages would then be posted around the site and monitored for 100 years. Future generations will be warned to steer clear for the next 10,000 years. Yes, 10,000 years. 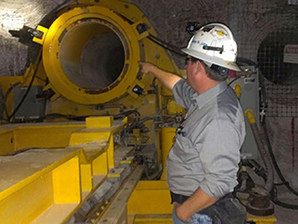 Bobby St. John, a spokesman for DOE contractor Nuclear Waste Partnership LLC, points to a machine designed to place radioactive waste into the walls of the WIPP facility. But Pearce and Rep. Tom Reed (R-N.Y.) have warned that WIPP could run out of junk to bury and floated legislation earlier this year to allow the site to accept waste with similar characteristics from all federal agencies. The watchdog group's Hancock, on the other hand, said the site is nowhere near running out of waste to bury. He pointed to an audit released in May by the DOE inspector general that found the agency is actually slowing its operations under tight budget cuts and missing aggressive goals to bury the current available waste. As for Pearce's bill, Hancock suspects Reed is interested in ensuring waste from the West Valley Reprocessing Plant in New York has a home. "If it takes you 14 years to get less than halfway done and you're slowing down, under what scenario is WIPP about to close?" he asked. "The premise is just false. When you challenge Pearce on why you're doing this, it's that they need to keep jobs." Hancock said Pearce's legislation would throw out bitterly won legal agreements that ensure WIPP only accepts defense-generated transuranic waste. As in years past, he said, it's another attempt to try to bring in different types of waste into the site. "It's the camel's nose under the tent," he said. Hancock also argued that changing the law would call into question any "consent-based" process the Obama administration's Blue Ribbon Commission on nuclear waste issues endorsed last year for finding new repositories and temporary disposal sites, he said. "There will always be attempts, fast or slow, to say, 'OK, eliminate the limits in the WIPP Act fought over for 20 years to change the nature of WIPP,'" Hancock said. "If our consent or nonconsent can be wiped away, why is the Blue Ribbon Commission's idea of consent something any other community would agree to?" But John Heaton, a special energy assistant to the mayor of Carlsbad, the Eddy County seat, disagreed. Heaton denied the bill would open the floodgates to new types of waste, only material similar to what the site already accepts. "The only difference is its pedigree; it's still a dog," he said. Workers at WIPP offer only a courteous but curt dismissal on the point. "We are authorized to receive transuranic waste, and we don't speculate about anything else," said Farok Sharif, president and general manager of Washington TRU Solutions, a contractor. Sitting in her living room in a Carlsbad trailer park, Betty Richards, 70, a known WIPP foe, explained how she gets attention. "Oh dear, what can the matter be?" Richards crooned, a scraggly gray cat perched on the couch near her shoulder. Betty Richards, 70, a longtime opponent of the WIPP site and resident of Carlsbad, is concerned about storing waste in the region. "DOE causes such misery. Please don't expose us to nuclear jeopardy. Please don't ya do it again," she sang. "The numbers were crunched to fit DOE's grand scheme, ignoring the data supported by our team. Water runs swiftly through karsts at the WIPP scene. You're gonna do it again." Richards moved to Carlsbad from Ohio in 1973, a tumultuous time when the federal government was moving forward with WIPP construction. Richards said she doesn't protest as much anymore. Unlike years past, she's now the lone protester in town and said it's hard to be taken seriously. "People don't want to hear it. They make you feel stupid," she said. "But I know what I'm talking about." Despite federal studies that found otherwise, Richards said she's worried that karst -- the same geology of sinkholes and large voids that makes up the nearby Carlsbad Caverns -- is too close to WIPP and could one day allow radioactive material to leak or migrate into the Pecos River and then to the Rio Grande and the Gulf of Mexico. EPA, however, investigated the issue in 2004 in response to public outcry and said there's no karst at the WIPP site. Richards is also worried oil and gas developers could drill into pockets of brine and gas captured in the salt formations. Salt supporters say opposition to WIPP is a thing of the past because the site has been operating safely since the 1970s. And myriad federal tests show that such public fear is unfounded, he said. "Fewer and fewer people cared because nothing happened, now it's 14 years and it's hard to get excited about it," said geochemist James Conca, who worked on both the WIPP and Yucca projects for the federal government. But Conca acknowledged that could all change if WIPP's mission changes. The biggest complaint would come from opponents accusing DOE of breaking its promise in the 1980s that high-level waste would only go to Yucca Mountain, he said. 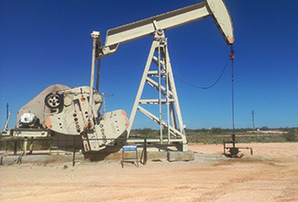 A lone pumpjack sits idle on the outskirts of the WIPP facility. Some scientists have pointed to a booming oil and gas industry around the site as a point of concern. "As soon as you say you're going to store high-level waste here, it's going to be dragged up again," Conca said. "They're going to say the DOE was lying." Hancock, who lives in Albuquerque, said some Carlsbad residents are paying activist groups like his to keep the heat on DOE and ensure safety problems are carefully reviewed at WIPP. But like any other town that grows around an industry -- be it coal or cars or nuclear waste -- he said there will always be a mix of opinions. "It's not true that there aren't other people in Carlsbad that have concerns; they fund my organization," he said. "These folks don't want to leave Carlsbad, but they want my organization to emphasize safety and ensure expansion efforts don't succeed." Scientists debating the merits of any nuclear waste site -- be it in salt, volcanic tuft, clay or granite -- know geology is only half the battle. "We have two parts to licensing a repository: We have science and we have politics," said Frank Hansen, the brains behind most of the federal studies at WIPP. "I can do the science, but the other half of the equation involves politics. The science is good and the science is necessary, but it's not sufficient." Even skeptics of salt agree on that point. "I think there are a lot of places that are good, there are lots and lots of places that are good, but they're precluded politically," former USGS hydrogeologist Bredehoeft said, adding that wouldn't include salt. "Nobody wants this stuff in their backyard. Who wants it?" Warning signs at the WIPP facility indicate the potential for PCBs from radioactive waste being buried in salt there. They also agree that budgetary battles on Capitol Hill that have tied Yucca Mountain in knots aren't encouraging states like New Mexico to step forward to take nuclear waste. "Do you think any state's going to stand up right now and say, 'We want a repository' when they can't even get a budget passed?" Heaton asked. "When Congress gets serious, maybe states will step up." Today, the focus is squarely on a draft bill that Senate Energy and Natural Resources Chairman Ron Wyden (D-Ore.) and ranking member Lisa Murkowski (R-Alaska), along with Sens. Dianne Feinstein (D-Calif.) and Lamar Alexander (R-Tenn.), floated earlier this year. But the language, which would revamp the country's stalled nuclear waste policies, has already run into stiff opposition from House Republicans who have vowed to fight anything that doesn't mention Yucca Mountain (E&E Daily, Feb. 7). Some salt proponents say Yucca Mountain is clearly the wrong direction. "I think the law will change, I think someone is going to wake up to the fact that we don't need to spend all that money [at Yucca Mountain]," said Forrest, Carlsbad's former mayor. "We started off, we didn't know what the hell we were getting into, now support grows more every day." That leaves the dim hallways of the WIPP facility as a focal point for scientific research, one that's attracted the attention of the Obama administration. It also leaves the Carlsbad area with a booming business that's flourished around the WIPP facility and earned the region the title of New Mexico's "nuclear alley," Heaton said. And amid the gridlock, some local officials are working on pushing through temporary, aboveground storage sites near WIPP. County officials in Eddy and Lea counties are offering to turn 1,000 acres within 10 miles of the WIPP in the state's southeast corner into a temporary lot for storing canisters of used nuclear fuel (Greenwire, Feb. 3, 2012). Former Sen. Pete Domenici (R-N.M.), one of WIPP's largest proponents and a member of the Blue Ribbon Commission, said he's on board. "If the people from the Carlsbad area and the leadership of the state of New Mexico desire to add to the WIPP site ... they are certainly not going to get any push-back from me," Domenici said. Whatever the decision, Hancock said science -- and not politics -- needs to be out front of any process. "What we don't have enough of in the U.S. in past decades in nuclear waste decisions is science driving the early parts of it, rather than the politics," Hancock said. "The science early on ought to be in charge. Then, based on that, some places are going to be better than others."